If you are trying to undo a simple text writing operation (e.g. removing a sentence you just wrote), your normal browser functions such as ctrl-z (or cmd-z) and ctrl-y (cmd-y) should work. If you are trying to undo more complex operations (e.g. remove an image you just added), open the History from under the Document dropdown in the toolbar. 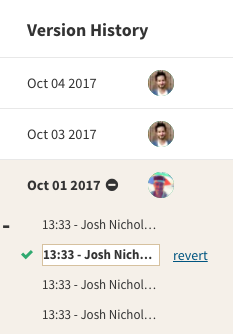 The history sidebar opens up and it shows the versions of your document. If you click on the + sign next to a version you expand that version showing all the granular edits. Click on one of them and the document will show you the differences between that version and the current version. If you want to revert to that older version, click revert.